The Phanerozoic eon is the interval of geologic time spaning from the appearance of abundant, macroscopic, hard-shelled fossils, roughly 542 million years ago (mya), to the present time. Preceding the Phanerozoic eon is the Proterozoic eon, with the boundary between the two eons being determined by the "sudden" appearance in the fossil record of a majority of the skeleton-bearing phyla of animals. This first major flowering of multicellular eukaryotes (organisms with neucleated cells), which is known as the Cambrian explosion, marks the onset of the Cambrian period—the first period of the first era (the Paleozoic) of the Phanerozoic eon (Mayr 2001). The Phanerozoic eon is divided into three eras: The Paleozoic, Mesozoic, and Cenozoic. Earlier stages provide the foundation for later stages, and for the modern world seen today. The name Phanerozoic derives from the Greek meaning, visible life, referring to the large size of organisms since the Cambrian explosion. The time span of the Phanerozoic eon includes the rapid emergence of a number of animal phyla, the emergence of terrestrial plants, complex plants, fish, and terrestrial animals, and the development of human beings and modern faunas. The Phanerozoic beginning point is usually set around 542 or 543 mya. However, the exact time of the boundary between the Phanerozoic and the Precambrian is slightly uncertain. In the nineteenth century, the boundary was set at the first abundant metazoan fossils. But since then, several hundred taxa of Precambrian metazoa have been identified due to the systematic study of those forms beginning in the 1950s. Most geologists and paleontologists would probably set the Precambrian-Phanerozoic boundary either at the classic point where the first trilobites and archaeocyatha appear; at the first appearance of a complex feeding burrow called Trichophycus pedum; or at the first appearance of a group of small, generally disarticulated, armored forms termed, "the small shelly fauna." The three different dividing points are within a few million years of each other. In the older literature, the term Phanerozoic is generally used as a label for the time period of interest to paleontologists. The term seems to be falling into disuse in more modern literature with greater emphasis being placed on the eon's three basic divisions, the Paleozoic era, the Mesozoic era, and the Cenozoic era. The Paleozoic (meaning "old animals") era spans roughly from 542 mya to 251 mya (ICS 2004) and is subdivided into six geologic periods (from oldest to youngest): Cambrian, Ordovician, Silurian, Devonian, Carboniferous, and Permian. The start of the Paleozoic era, between roughly 542 mya and 530 mya, is a time when a large number of body plans appears for the first time in the fossil record. This Cambrian explosion, as it is called, offers a particularly stimulating challenge for all who would attempt to explain the phenomena. Indeed, all of the major body plans (phyla) of complex, multi-cellular, macroscopic organisms that exist today appeared in this time period, and since then no fundamentally new body plan has come into existence (Mayr 2001). Among the phyla that were first evident in the Cambrian period were the brachiopods, mollusks, arthropods (trilobites), and echinoderms. Mayr (2001) concludes that the apparent explosion of new phyla in the early Cambrian was possibly due to the skeletonization of a variety of soft-bodied organisms that already existed in the Proterozoic. The Mesozoic (meaning "middle animals") era extends from about 251 million years ago mya to 65 mya and is separated into three geologic periods: Triassic, Jurassic, and Cretaceous. It is often called the "Age of the Dinosaurs," after the dominant fauna of the era. Many diverse animal species appeared during this time, including birds and mammals. The Cenozoic (meaning "new life") era is the most recent of the three classic geological eras of the geologic time scale. It covers the 65.5 million years since the Cretaceous-Tertiary extinction event at the end of the Cretaceous and is ongoing in the present time. The Cenozoic era is divided into two periods, the Paleogene and Neogene, and they in turn are divided into epochs. The Paleogene period comprises the Paleocene, Eocene, and Oligocene epochs, and the Neogene comprises the Miocene, Pliocene, Pleistocene, and Holocene epochs, the last of which is ongoing. The naming of periods and epochs in the Cenozoic era is most formally assigned as presented here, but there remain scientists committed to an alternate schema that divides the Cenozoic into periods with different names and different definitions. One of these alternate periods, the Quaternary, comprises the Pleistocene and Holocene epochs, while the other period, the Tertiary, comprises the Paleocene, Eocene, Oligocene, Miocene, and Pliocene epochs. This Tertiary period is the one referred to in the Cretaceous-Tertiary extinction event. Map of Pangaea, which began to form near the end of the Paleozoic era. During the Phanerozoic eon, continents drifted about, eventually collected into a single landmass known as Pangea, and then split up into the current continental landmasses. Some scientists theorize that the Phanerozoic eon began shortly after the breakup of a hypothesized supercontinent at the end of a global ice age. Throughout the early Paleozoic era, the Earth's landmass was broken up into a substantial number of relatively small continents. Toward the end of the Paleozoic era, the continents gathered together into the supercontinent Pangea, which included most of the Earth's land area. 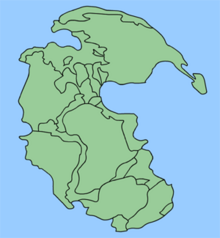 The Mesozoic era featured the dramatic rifting of the supercontinent Pangea, which gradually split into a northern continent, Laurasia, and a southern continent, Gondwana. By the end of the era, the continents had rifted into nearly their present form. Laurasia became North America and Eurasia, while Gondwana split into South America, Africa, Australia, Antarctica, and the Indian subcontinent. Geologically, the Cenozoic era is the time interval during which continents moved into their current positions. Australia-New Guinea split from Gondwana. Antarctica moved into its current position over the South Pole. The Atlantic Ocean widened and, later in the era, South America became attached to North America. 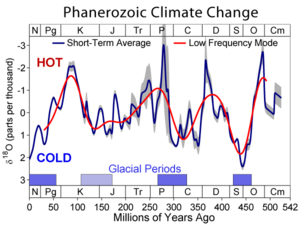 During the Phanerozoic eon, Earth's climate varied between conditions that support large-scale continental glaciation and those which are extensively tropical and lack permanent ice caps even at the poles. The difference in global mean temperatures between a fully glacial earth and an ice free Earth is estimated at approximately 10 °C, although far larger changes would be observed at high latitudes and smaller ones at low latitudes. One key requirement for the development of large scale ice sheets is the arrangement of continental land masses at or near the poles. With plate tectonics constantly rearranging the continents, it can also shape long-term climate evolution. However, the presence of land masses at the poles is not sufficient to guarantee glaciations. Evidence exists of past warm periods in Earth's climate when polar land masses similar to Antarctica were home to deciduous forests rather than ice sheets. The establishment of CO2-consuming (and oxygen-producing) photosythesizing organisms in the Precambrian led to the production of an atmosphere like today's, though for most of this period it was much higher in CO2 than today. Similarly, the Earth's average temperature was also frequently higher than at present. It is clear that the preindustrial atmosphere, with only 280 ppm CO2, is not far from having been the lowest concentration of CO2 since the rise of macroscopic life. 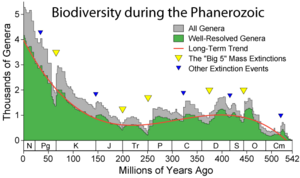 During the Phanerozoic eon biodiversity shows an irregular but overall steady increase from near zero 542 mya to several thousands of genera. Biodiversity numbers would have been highly influenced by major changes in climate, movement of the continents, and extinction events such as asteroid impacts. Superimposed on the long-term evolution between hot and cold climates have been many short-term fluctuations in climate similar to, and sometimes more severe than, the varying glacial and interglacial states of the present ice age. Some of the most severe fluctuations, such as the Paleocene-Eocene Thermal Maximum, may have been related to rapid increases in atmospheric carbon dioxide due to the collapse of natural methane reservoirs in the oceans. Severe climate changes also seem to have occurred during the course of the Cretaceous-Tertiary, Permian-Triassic, and Ordovician-Silurian extinction events; however, it is unclear to what degree these changes caused the extinctions rather than merely responding to other processes that may have been more directly responsible for the extinctions. International Commission on Stratigraphy (ICS), Homepage. Retrieved January 2, 2007. Veizer, J., Y. Godderis, and L. M. Francois. 2000. Evidence for decoupling of atmospheric CO2 and global climate during the Phanerozoic eon. Nature 408: 698–701. This page was last modified on 11 April 2016, at 18:38.